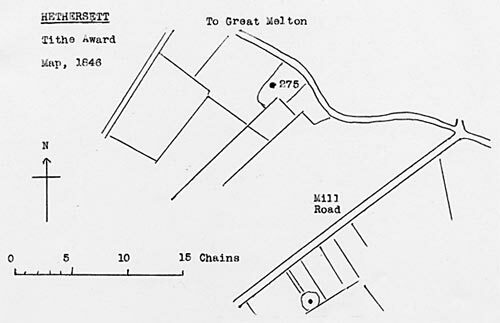 Hethersett Gt Melton Road mill stood just to the south of Maltster's Lane. The mill had a roundhouse and used patent sails to drive two pairs of French burr stones and a flour mill. Elizabeth & William Robertson admitted to copyhold 4 November 1790. 1 November 1809 death of William Robertson presented at Court. Property to grandson of John Scarfe, William Robertson; by will dated 16 May 1818 he appointed John Robertson and Thomas Redgrave Executors and Trustees. George Robertson was admitted to Copyhold. Mr. Ives will submit to Auction aat the Norfolk Hotel, Norwich on Saturday May 29, at 4 o'c the following desirable Investment. An Excellent MILL in full trade carryiong two pairs of French stones, patent sails, flour mill & three feet cylinders. Four pieces of rich & productive Arable & Pasture Land containing about 8 acres with barn, cart lodge etc. The Property will be Sold upon the terms that the Purchaser shall satisfactorily secure an Annuity to be paid half yearly to the proprietor & his wife aged respectively 64 & 52 years during their joint lives & the life of the survivor. The above Property is pleasantly situated next thew road in the parish of Hethersett about 5 milkes from Norwich, the Eastern Union Railway runs through the parish & possesses the advantages of two postal deliveries in the day. Apply to Messrs. Miller & Son, Solrs. Surrey Street or the Auctioneer, Crown Bank Plain, Norwich. William Robertson of Stratton_St Michael_postmill, was the eldest son of William Robertson and Elizabeth Scarffe of Hethersett. Robert Robertson took over at Market Hill mill in Yarmouth before moving to Sprowston. Susan Robertson married George Willis, a miller & baker from Mendelsham, Suffolk . John Robertson's son George Wilby Robertson worked in one of the Upper Hellesdon and one of the Gayton windmills. Robert's Robertson's oldest daughter, Elizabeth, married a Harrison of Sprowston postmill. Elizabeth's sons worked Oulton Broad, Gisleham, Wangford and Sprowston mills. Her oldest son Robert William helped at Sprowston_postmill after his father was crushed to death and he later bought a mill at Oulton Broad. Her next son, George, continued the family line at Sprowston and her youngest son, William Alfred, was an apprentice at a Wymondham mill and a journeyman at Great Bentley, Essex and he later owned St Margaret's Church Mill in Lowestoft. James Denny Chapman of Great Yarmouth, Linen draper. 4 Enclosures, 7a. 2r. 1p. post windmill with roundhouse, stable and gig house and also messuage, barn and 2 cottages erected by George Robertson ... bounded on the north by Maltster's Lane ... Consideration - Payment of an annuity during the lives of George Robertson and Phoebe Robertson of £106 per annum in half yearly instalments. With reversion to annuitant(s) upon default of payment. Between Sunday and Monday last, Aeolus "made a night of it" and in the exuberance of his spirits thought himself at liberty to play the most fantastic tricks with the sober denizens of earth, tossing over wind-mills, walls, and chimneys -- snapping large and sturdy trees -- wrenching off bars, bolts and chains, and burglariously entering the homes of affrighted people. In the prosecution of these manoeuvres, he was so noisy that, in many instances, the good folks thus disturbed, unable to rest in their beds, treated themselves to an early breakfast at the unsonted hour of 2 a.m., and watched his freaks till he took his flight shortly before daybreak. ... A substantial post-mill at Hethersett, in the occupation of Mr. Guyton, was blown to the ground and smashed to atoms, and a mill at Ringland met a precisely similar fate. The excellent HOUSEHOLD FURNITURE, &c., two superior Harness Cobs, 14 hands high (very fast), three light Luggage Carts, Harness and Saddlery, Miller's Tackle, and Utensils in Trade, Agricultural Implements, and other Effects of Mr. GUYTON, Miller, at Hethersett, near Norwich. Descriptive Catalogues may be obtained on the Premises; and of the Auctioneers, Norwich. H. C. A. GUYTON'S ASSIGNMENT. HENRY CLARK ADCOCK GUYTON, of Hethersett, in Norfolk, Miller, having executed an Assignment of all his Estate and Effects to Trustees upon trust for the equal benefit of such of his Creditors as shall execute the same. Notice is hereby given that such Assignment is lying at my Office for the signature of such of the Creditors as elect to take the benefit thereof: and all Persons indebted to the Estate are requested forthwith to pay the amount of their debts to me. Insolvent Debtor to be heard before the Judge of the County Court of Norfolk, holden at Norwich as follows, at the Shirehall, Norwich Castle, Norwich, on Tuesday, the third day of August, 1858, at Ten o'clock in the forenoon, precisely. HENRY CLARKE ADCOCK GUYTON (sued and arrested as Henry Guyton), late of Hethersett, in the County of Norfolk, in no business or employment, previously of Hethersett aforesaid, Farmer and Miller, and Dealer in Flour and Radan. Henry Clarke Adcock Guyton, late of Hethersett, Norfolk, farmer, a dividend of 1s. 8½d. in the pound, payable at 5, Portugal-street, Lincoln's-inn. DEATH OF MR. GUYTON. -- By the somewhat sudden death of our worthy postmaster, Mr. Henry C. A. Guyton, aged 61, which took place in Park Cottage in this village on the 10th inst., Shipdham is bereft of one of its most respected parishioners. Mr. Guyton in his public duties discharged them in such an efficient manner he gained the regard of all he came into contact with. By all classes is loss is sadly mourned, and they deeply sympathise with the sorrowing family who lament his call hence from their busy midst. The funeral took place on Thursday last at Wacton, near Wymondham, and as the procession passed through the parish nearly all the principal shops were closed and blinds drawn. FUNERAL SERMON. - On Sunday evening, the 19th inst., a funeral sermon was preached in the parish church, relative to the death of Mr. Guyton, by the Rev. W. G. Baxter, who said that Mr. Guyton had been beloved and respected by every body, and that all the village sorrowed with his bereaved relatives. Phoebe Aldred readmitted to estate upon default of payment of annuity. She died 25 June 1895 leaving property to her niece Sarah Ann Aldred Woods. Your web page on the post-mill at Hethersett shows the last occupant as Henry Clarke Adcock Guyton in 1854 and 1856 with no entries thereafter. You may be interested to know what happened to the mill. It is a rather sad story. The mill was destroyed by a storm on the night of 7-8 March 1858 causing Henry Guyton to lose his business, be forced into bankruptcy and lose his home and possessions. Despite this enormous setback, he must have been a man of resilience and determination as he subsequently became a coal merchant and later the village postmaster of Shipdham. The story is summarised in the references enclosed.